For proper interaction with the instrument, knowing the names of the different parts of the violin is essential for any violin player. There is no difference between the structure of violins used Indian classical music and violins used in other forms. All that is different is the tuning of the strings. The scroll of the violin is the very top of the instrument. The scroll can be identified by its characteristic curl design; sometimes instruments have scrolls that were more elaborately carved with animals or figures. The scroll is part of the violin that is placed in the leg. The nut is a piece of wood at one end of the fingerboard. The nut has grooves in it which the strings sit in so that they are properly spaced. Strings are the wire windings made from a variety of different materials, like metals or gut. The make-up of the string shapes of the tone of the violin significantly. The vibration of the string causes production of sound. Tunings of these strings are discussed here. The fingerboard is the black playing surface underneath the strings. The fingers of the performer which press down on the string come in contact with the fingerboard. The bridge is a wooden device that supports the strings of the violin and transmits the vibration of those strings the soundboard (or body) of the instrument. Based on the preferences of the violinist, the bridge is set to a height and angle, which impacts the way the strings are played. The body of the violin is the part that amplifies the sound of the violins. After the vibration from the string reverberates within the body of the violin, the sound waves are directed out of the body through the F holes. The chin rest is a device that supports the players chin when they are playing the violin. The Indian style (seated on the floor) of playing the violin doesn’t require the use of the a chin-rest. The tail-piece is what the strings are attached to at the bottom of the instrument, closest to the players chin. Fine tuners are attachments with screws found on the tail piece. They help in making minute changes to the tuning of the strings. The main stick of the bow is usually made of wood or sometimes carbon fiber. The stick needs to be naturally curved to be able to support the tightening and loosening of the bow hair. The frog is a weighted black piece to one end of the bow that the violinist holds. 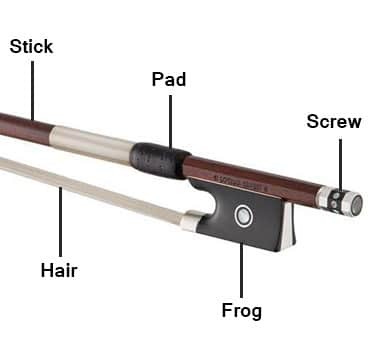 The frog is where all the mechanics of the bow happen. The pad of the bow assists the player in holding the bow. Sometimes there is winding to the top of the padding. The screw is on the end of the frog which tightens or loosens the hair.